Feeling empty in the fruit bowl. W is wondering why he can’t have any apples. He’s ecstatic over the sudden surplus of packaged cereal bars, so he’s not suffering. He can’t wait to have Kraft Dinner, especially with hot dogs(!). But he’s accustomed to eating a few apples and pears per day, including a bowl of apple slices at bedtime. Dark red delicious apples, to be precise. It feels odd to tell him he can’t have fruit. We have no bananas, no smoothies, no raisins and dried apricots. I’ve tried to explain why, but his 4 year old mind isn’t quite grasping the concept. It seems to be a bit of a crapshoot – over breakfast Mike read aloud Michelle’s story in the Herald this morning – in her hamper there was a bag of spinach, 3 oranges, 5 apples, a bag of baby carrots and a caesar salad kit besides the mushrooms, plantains and iceberg lettuce. And hers was for a single person with no kids. I never thought I’d be envying someone for their apples. Of course it always depends on what’s there on the day of the pickup – even so, we were there on the same day, just a couple hours before she was. On the other hand, I read about someone else getting Lucky Charms, and I’m thankful for my plain Cheerios. Breakfasts and lunches have been easy – there has been a lot of Cheerios, peanut butter toast, eggs on toast and for our picnic today, peanut butter sandwiches, cereal bars and fruit snacks. 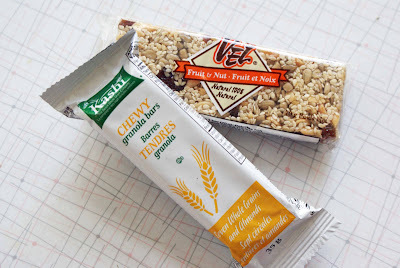 I was happy to see two healthy granola bars (above) in the mix – one made exclusively out of seeds, nuts and honey – tough on the teeth (it seemed old) but filled the gap quite nicely. 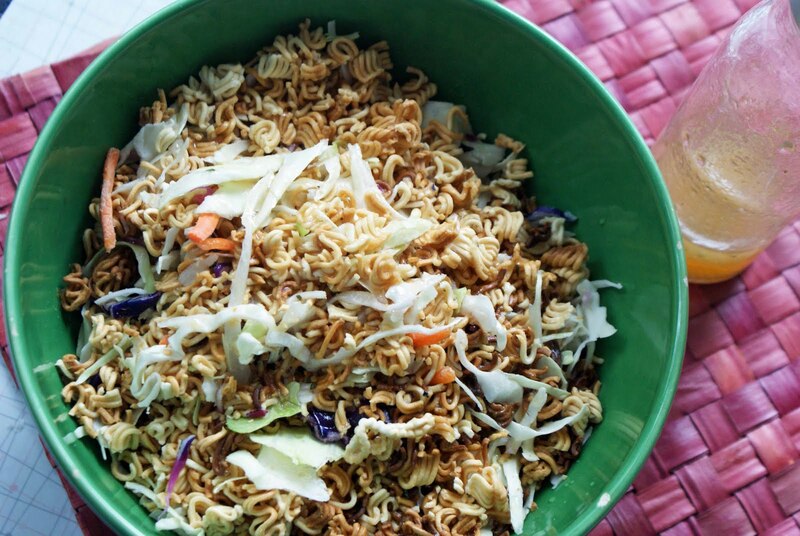 This afternoon I made a big bowl of Ichiban salad with some of the coleslaw and the one package if generic Ichiban noodles – generally I make this with sliced almonds, but instead I toasted the dry noodles in the toaster oven and it was just fine. The dressing was oil, vinegar, sugar and just a little shake from the seasoning packet.